I’ve had the pleasure of many wonderful bird sightings since spring began. Some are old friends, and at least one is a new addition. 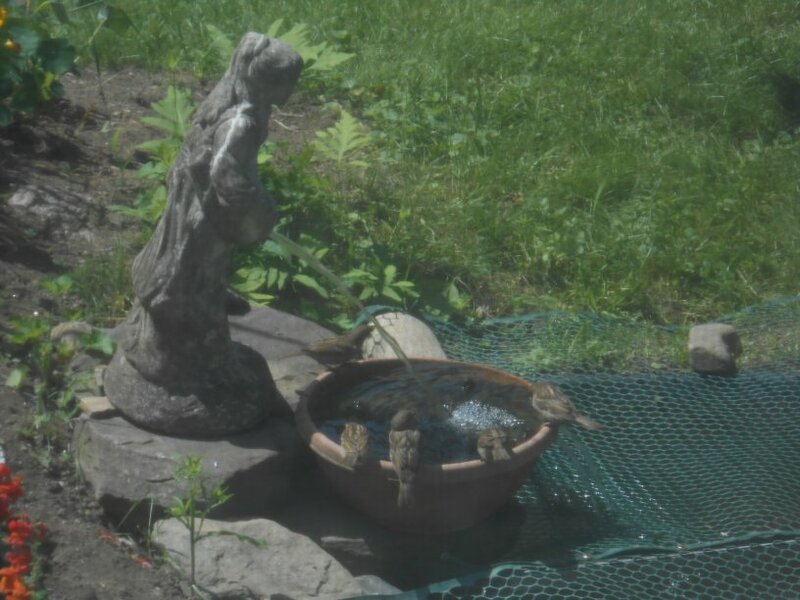 Because I don’t have a fancy camera and the birds are too shy to let me get close enough or they don’t stay still long enough for me to get a good shot, some of these pictures aren’t the best and some I had to find online – but I hope you enjoy hearing about what I’ve been seeing lately. 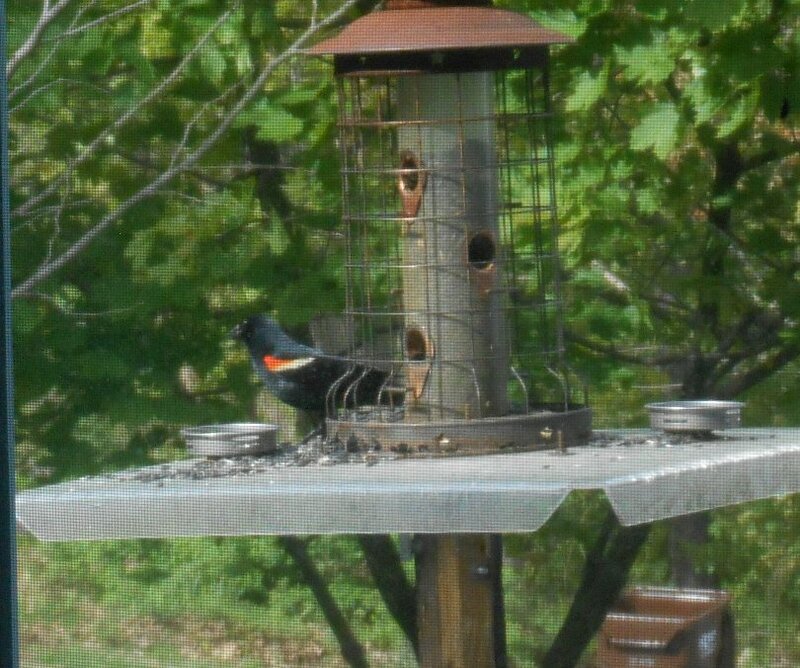 One of the first signs of spring was the return of my friends, the Red-winged Blackbirds. They’re usually the first to arrive, so I’ve been seeing them March 6th. They even stuck it out through our April torture by snow. I’ve seen several males and also several females. I guess these folks must find my feeders quite the congenial place. 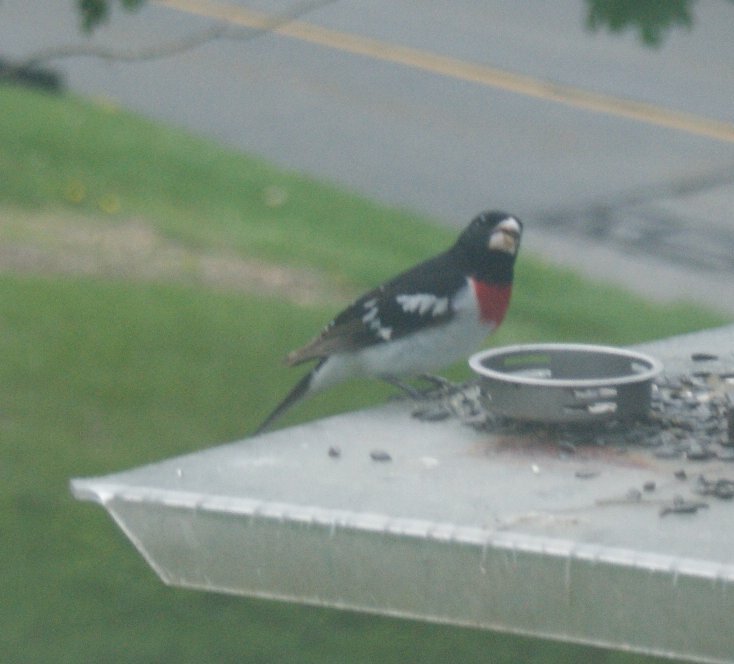 In April, I was further delighted by the return of the Rose-breasted Grosbeaks. Interestingly enough, my first sighting this year was almost exactly the same date as my sighting last year. This year, we have at least one male and one female – it’s hard to tell if I’m seeing the same or different ones every time. Happily, even as we move through June, I still see these beauties every day. Please forgive the fuzziness in some of the pictures. It’s rather hard to compensate for the pattern-effect of my window screens. 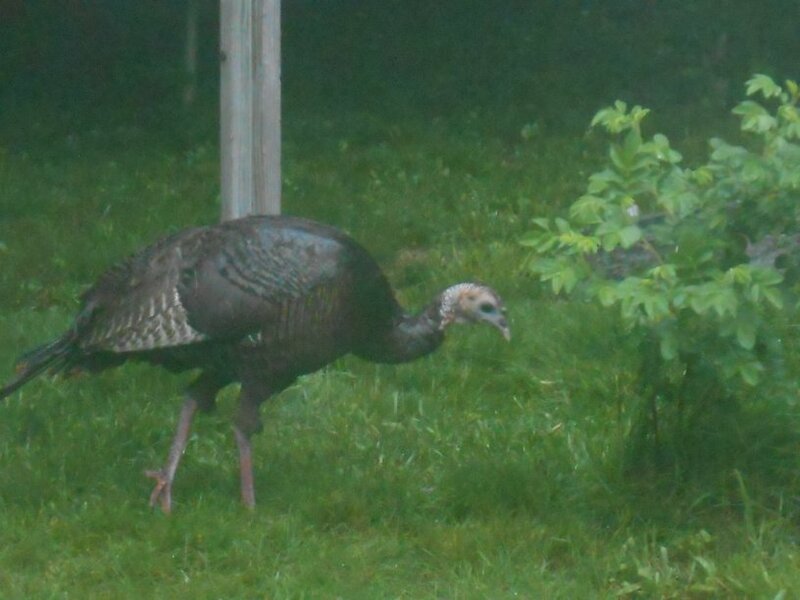 Also back once more is our buddy from last year, turkey Raymond Burrd – though I have since figured out that “he” is a “she.” Still, if there can be gals called Micheal, Jamie, and Ashley, having one named Raymond shouldn’t be any problem. It’s the twenty-first century, folks. Get over it! 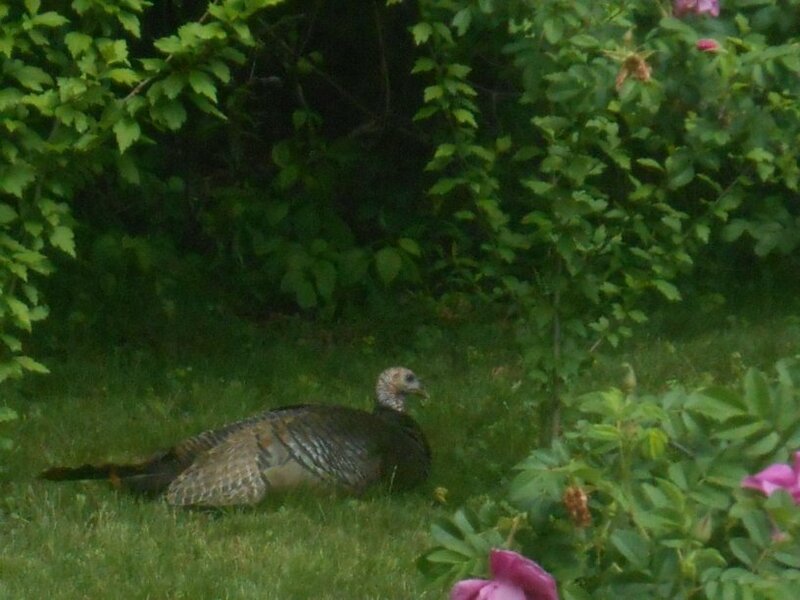 She has shown up every day, sometimes more than once a day for over a week now – starting 6/4. She’s pretty friendly – not that she’s asking me to tea or anything, but she doesn’t startle and run away or threaten me when I have to walk past her for one reason or another. If I’m enraptured in reading, she’ll wander by quite close without turning a feather. My neighbor said he thought she was going to hop into my lap the other day! Although Natasha was howling out the window at Raymond in the beginning, she and Rosalind have settled down to a minor glance in the turkey’s direction while looking daggers and claws at chipmunks and morning doves. 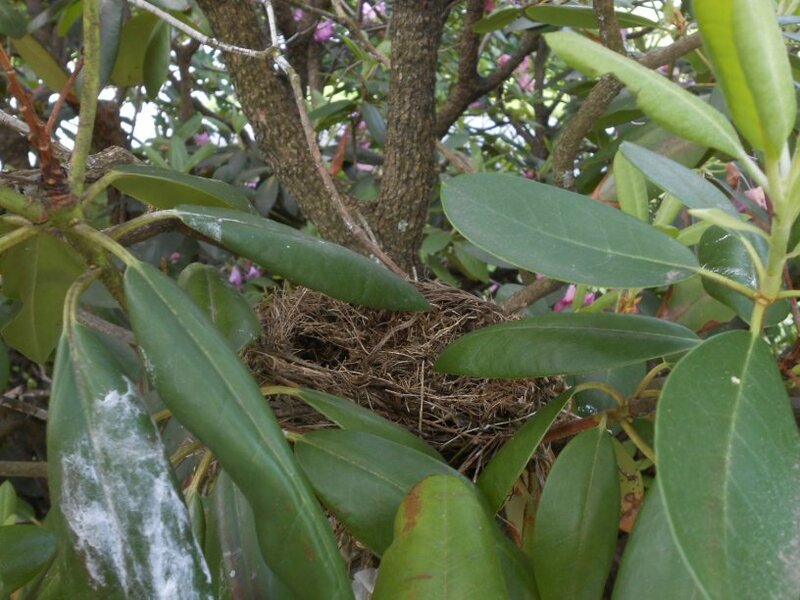 We were not able to use the front porch for a while because the Robins would shout up a storm at us – they had built a nest in a rhododendron surprisingly close to one of the porch columns. It was so surprisingly close that I happened to glance down and was shocked to see two young, speckled robins checking me out from a nest. Needless to say, the flowers on the front steps went thirsty for awhile. After some time, no Robins could be heard squawking in the rhododendron, so I checked and noted there were no kids in the nest or parents around. Fledging must have occurred, and the parents probably figure they’d move to a neighborhood with less traffic for their next clutch. That’s why I was able to take these pictures. 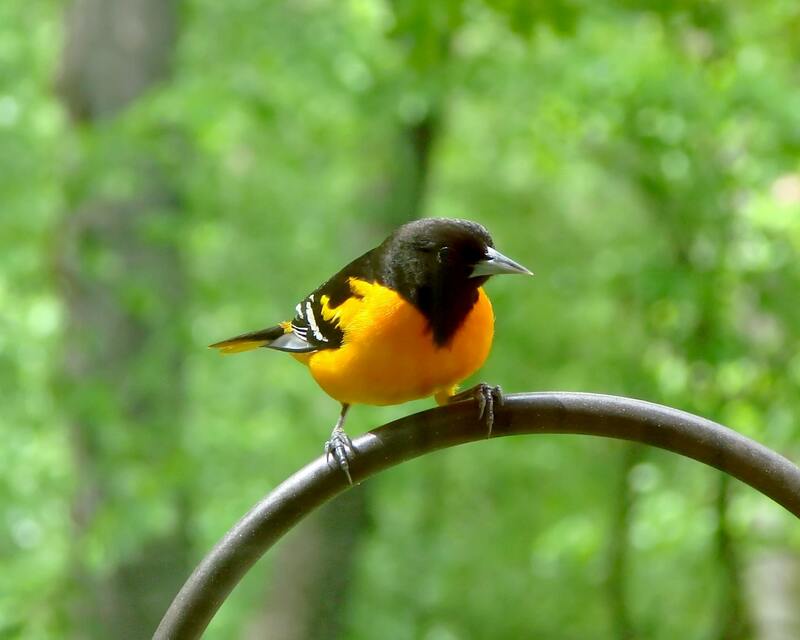 We also had a Baltimore Oriole visiting our yard. I had heard him for some time, then found him sitting in the juniper bush outside my bedroom window. I ran to get my camera, but he’d taken off when I got back. I have seen him in the high trees in my backyard and hear him as well. 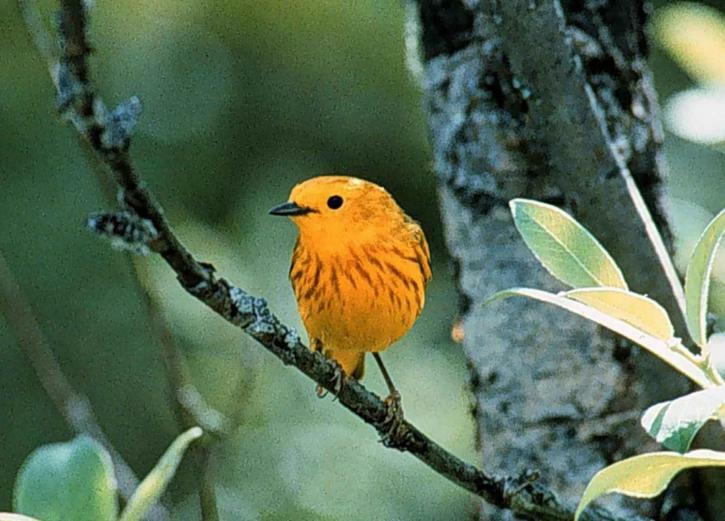 In fact, I’ve had lots of Oriole and Yellow Warbler sightings. We saw both types of birds at the Blackstone River Trail and I later had about six sightings of as many as two Orioles at a time by the Quinnebaug River in Putman, Ct. There were also plenty of Yellow Warblers, too. I wonder if the plentitude of Orioles has anything to do with the large number of Gypsy Moth Caterpillars invading New England now. I could hear the caterpillars in the trees by the Q. River – I’m too delicate to tell you what I’ve been informed that I was hearing the caterpillars doing. Let’s just say I was glad I had a hat on! 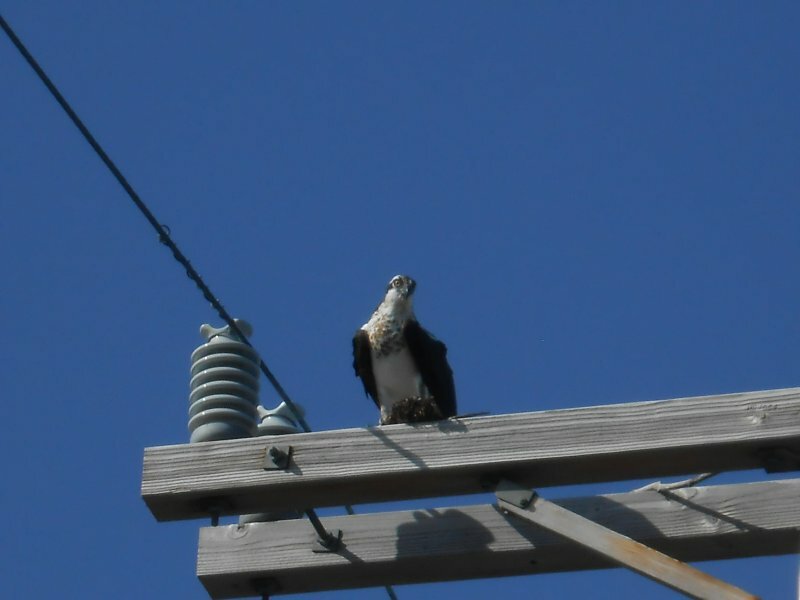 On a trip to the rail trail that runs from Falmouth to Woods Hole, my husband and I were lucky to see Ospreys hunting and feeding their kids. Here’s an older picture from the same area. We also saw out first Blue-grey Gnatcatcher. It’s quite the lively bird, and you can’t miss the white vertical bars on the sides of its tail. This link shows the little guy in action and captures his blue-gray colors. Unfortunately, I haven’t seen as many goldfinches, chickadees, Titmice, and nuthatches of late – though I have seen s few. I know they sometimes disappear around this time to brood their young, then return with the kids, when they can fly, for family smorgasbord. I hope they haven’t been driven out by the greedy Grackles, Mourning Doves, and Sparrows. 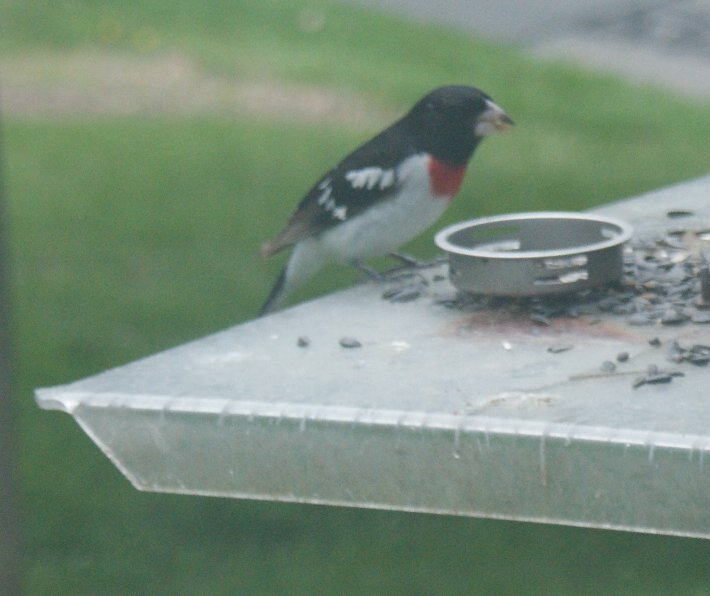 Though Sparrows can be pesky, I have to admit these guys are cute. 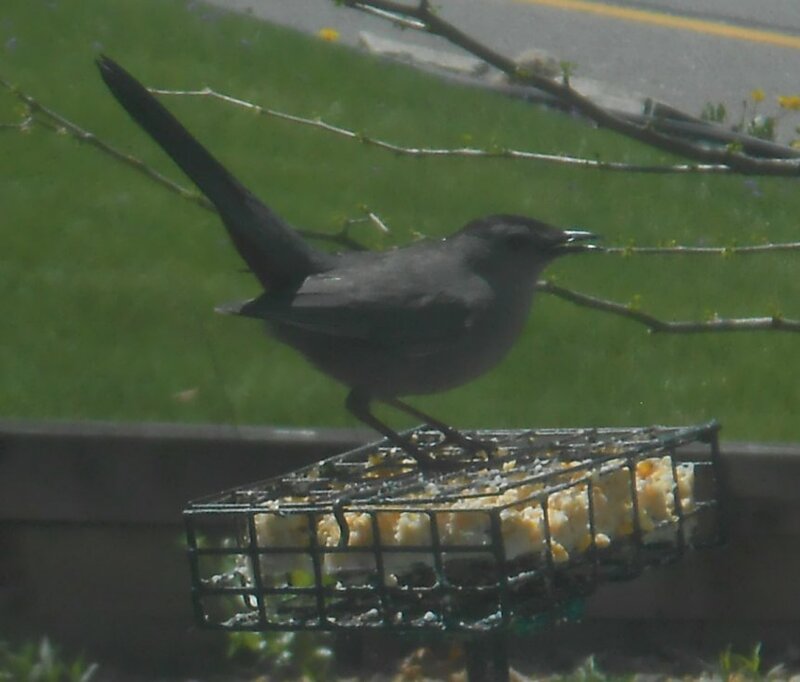 At least I saw the Catbird again yesterday while I was reading! This picture is from last year. 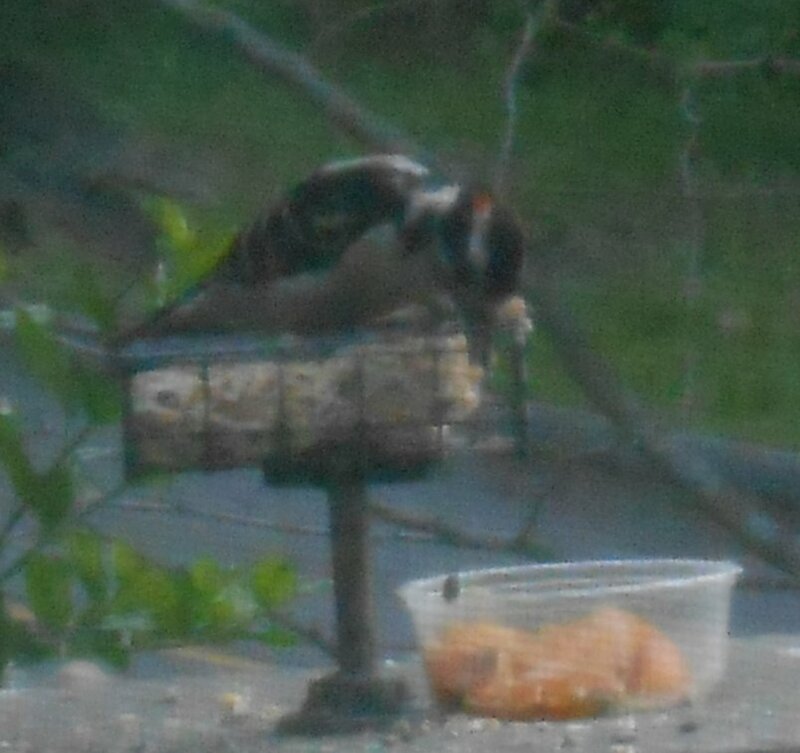 Downy and Hairy Woodpeckers have come by, as well as a Flicker. 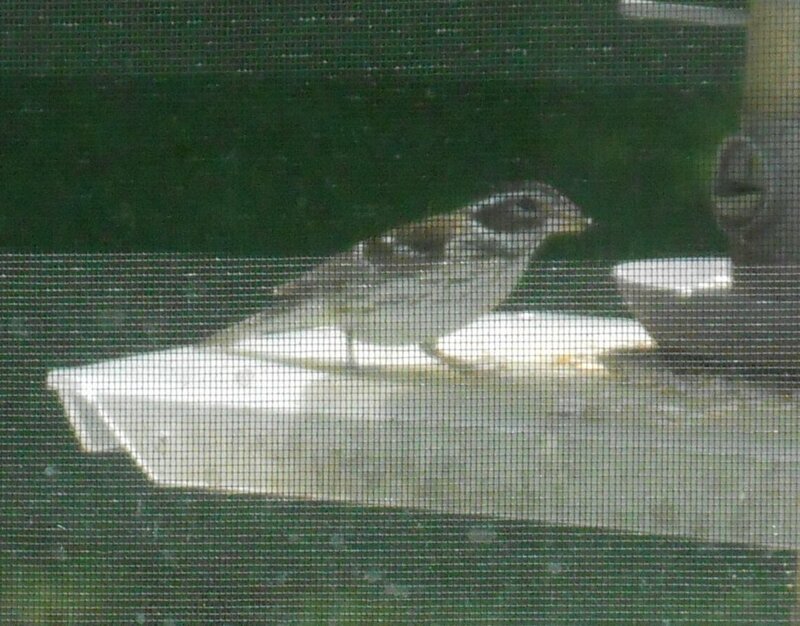 Here are two neat, albeit window-screen-fuzzed, photos of a Hairy Woodpecker. 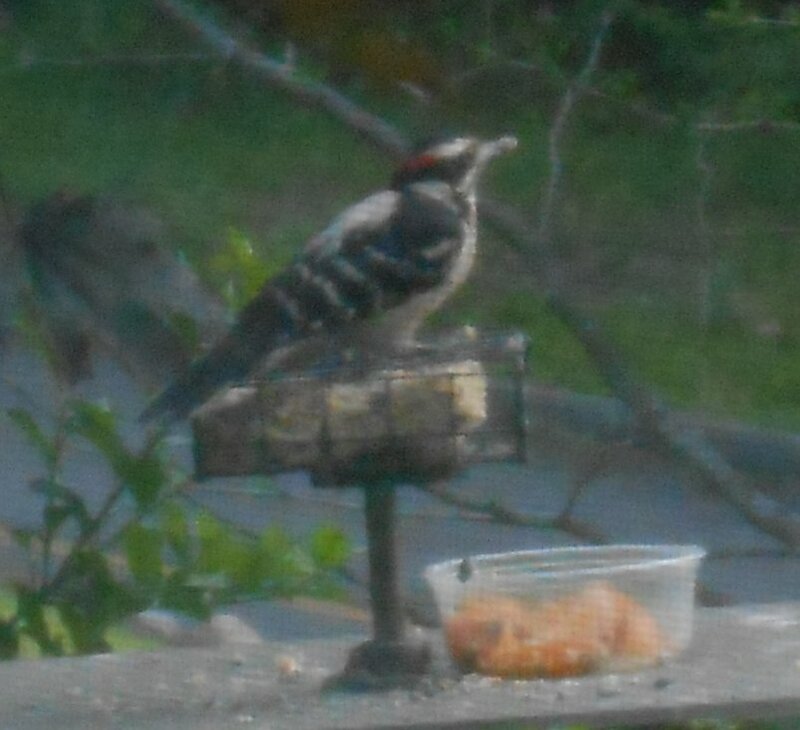 Like most Woodpeckers, this guy just loves that suet! Yellow Warbler image from: Pixnio.